This photo is as good as any to show why it's not a good idea to drive this road in a two-wheel drive vehicle when the road is wet. 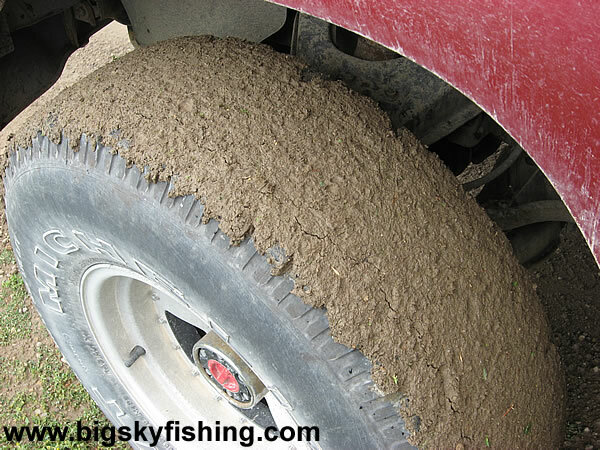 The mud "sticks" to the tires and only a lot of speed gets rid of it - speed which is difficult to achieve on a mountain road, especially one that is wet and where the lack of traction (caused by the mud) makes it difficult to control the vehicle. I'll also note that the day I drove this route, the road wasn't "that" wet. In short, this is what the tires looked like after driving through a light rain. It shouldn't take a leap of imagintion to get an idea of what driving this road is like during "very wet weather" events.